If you own an iPhone, iPod Touch, or iPad that uses lightning port technology for charging then there’s a good chance that eventually you’ll find yourself in a common situation. Your device no longer charges. While there are many possibilities for why this is happening let’s rule out the easiest ones first. I can’t tell you how many times I’ve seen it end up being something very simple but I will say that my customers are almost always overcome with joy the moment that they realize it will cost them next to nothing to get their phone working again. This might seem like a no brainier but in some cases there may be more than one catch to this seemingly simple solution. Not all charging blocks are equal to start with. 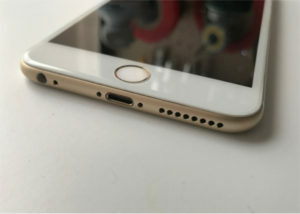 If you have an iPad and try to charge the battery using one of the small square blocks that cam with your iPhone then you are going to find that charging takes a very long time. The output on an iPhone charging block is not sufficient for the battery cells inside of your tablet and in the worst case scenario you could potentially start a fire if it overheats. Also make sure that your charging block is functional. When it is connected to another device using the same wall outlet does it charge? If so, great. Let’s move on to the next link in the chain. Are you using an MFI cable? iDevices are very picky about the charging blocks and cables that you use. They are so sensitive that Apple has built in a system that will disable your charging ability when your phone detects voltage spikes i.e. an unstable charge. If you’ve ever seen the “This accessory may not be supported” message on your display that means your phone has detected something out of the ordinary and is warning you of potential problems. If you saw this message and now your iPhone won’t charge or it has exhibited something called “fake charging” where the percentage seems to get stuck or your phone powers down out of the blue you might need to take more serious steps to correct the problem. Before you do that however take a look inside of your lightning port. Here’s a video that might help solve your iPhone charging problems. Do you see lint, dust, or other debris? If so then you might be in for a pleasant surprise especially if you were having trouble getting your charging to fully plug in fully. Besides being physically durable lightning ports for some reason tend to attract dirt and dust like a magnet. Often we see phones that have pocket lint, paper, and who knows what else jammed inside of the port. By carefully removing this stuff you might be able to get your phone charging again with minimal effort and cost. Of course you’ll want to take steps to prevent this problem in the future but for now let’s concentrate on getting our port cleaned out. The good news is that cleaning out an iPhone charge port is not a big deal at all. Most people express concern over this task and I suggest that if you have any concerns whatsoever then by all means take your phone to someone that you can trust to clean it for you. Here’s a hint: am Apple store is unlikely to do much beyond suggesting that you pay for your phone to be exchanged which is making a simple problem much more complicated than it needs to be. Just about any third party repair store should be able to perform this task in minutes and with little to no cost for you. If on the other hand you do want to try it yourself here’s a couple things that you should know before hand. There is no electricity flowing into the port when it’s not plugged in. That’s right, unless you have some kind of mutant phone that was tampered with in ways that are unimaginable to us you will not get shocked during this process. Also, you can’t “short” anything out as there is no current to short in the first place. We still recommend using a plastic or wooden tool such as a toothpick simply to reduce the chances of damaging the internal part of your charge port but as long as you are gentle and take your time it would be difficult for you to cause any damage. If you’ve tried all of the above and are still having problems then it’s time to perform higher level diagnostics. For many users this is the part where you need to seek professional help so proceed only if you have the tools, experience, and confidence to carry out the following steps. By the way you can always contact us for a repair quote if you need help. From here we recommend using an ammeter to test your phone and see how much if any voltage is getting to the battery. This little device can save you a lot of guesswork since zero amps typically indicates that the charging system rather than the battery is your problem. If the battery seems to be charging but won’t keep the phone turned on then it might be a good time to replace yours and given Apple’s throttling policy we’d recommend replacing any battery that is more than a year old since your phone will likely be running at less than optimal performance but we’ll save that story for later. If you aren’t getting current and your port looks healthy then it may be the Tristar IC that is your problem. Remember earlier when we talked about the system that safeguards your phone against voltage spikes? Well the Tristar chip is designed to fail before that unstable voltage can damage your phone. As a result it is sensitive to the point that it seems to fail if you look at it sideways. Okay that’s an exaggeration but suffice to say that it takes very little to kill this guy. It’s not really a fuse but a blown fuse is a close enough analogy in that once it blows you have to replace it. And that is where things get particularly complicated. For this task you need microsoldering equipment, experience, and of course a replacement part. To get an idea of what you’ll need check out the video below. If you’re iPhone won’t charge and you need help don’t hesitate to contact us.